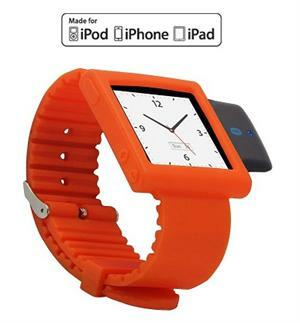 Home > Bluetooth > KOKKIA i10sWatch (COLOR OF THE YEAR TANGERINE TANGO) Ultimate Fashion Watch. Nano 6G watch band, with Tiny Luxurious i10s Bluetooth iPod Transmitter. The Ultimate Fashion Watch, in Bold Tangerine Tango . Wear your Tiny i10s snugly and comfortably with your iPod Nano 6G on your wrist, while you enjoy your wireless Bluetooth music. i10s will respond to Receiver Remote AVRCP commands (Play, Pause, Next, Previous). Smallest size compared to other products made by other manufacturers in this category. 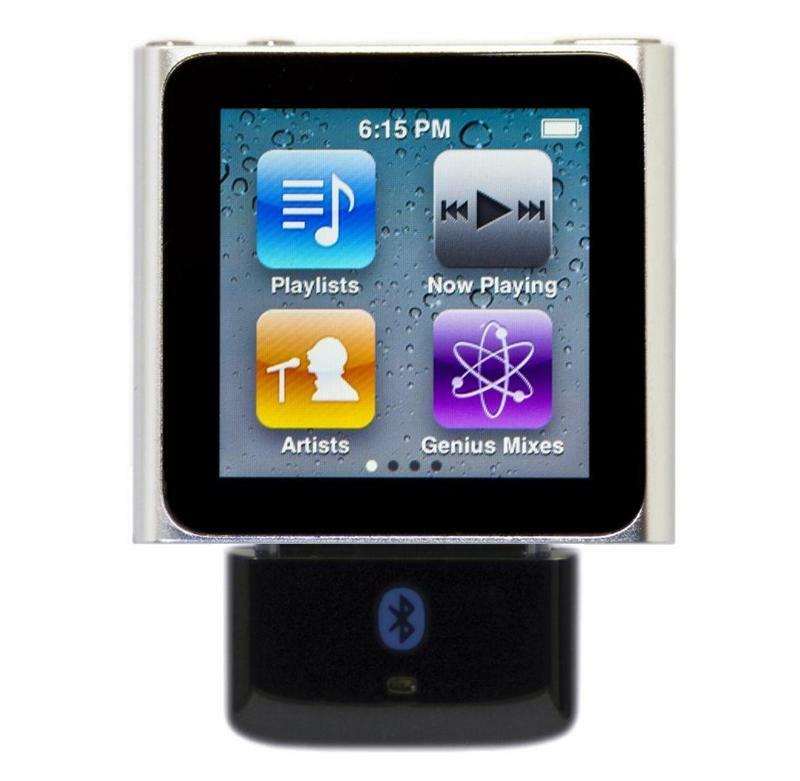 Transmits stereo audio from iPods, iPhones, iPads, iPod Touch wirelessly to compatible Bluetooth stereo receivers. This product is BOTH Made-for-iPodm Made-for-iPhone and Made-for-iPad, unlike many other iPod Bluetooth Transmitters that are only Made-for-iPod. Includes Authentication IC chip, which allows for local iPod, iPhone, iPad volume adjustment - that is not possible with other Made-for-iPod only transmitters that do not include Authenticaion IC chip. Low power consumption, for many hours of wireless audio enjoyment with iPods, iPhones and iPads. No batteries needed, powered by iPod/iPhone/iPad. No cables needed, attach to iPod/iPhone/iPad via 30-pin connector. Bluetooth 2.1 + EDR, Class 2. Works with iPad 3, iPad 2, iPad, iPhone 4S, iPhone 4, iPhone 3GS, iPhone 3G, iPhone (1st gen), iPod touch (1st-4th gen), iPod nano (1st, 2nd, 3rd, 4th, 5th and latest 6th gen tiny iPod nano), iPod classic (80, 120, 160GB). (1) i10s includes an Apple Authentication chip that will authenticate with iPod/iPhone/iPad. This authentication process enables local volume adjustments on the iPod/iPhone/iPad to change the volume at the remote receiver. Sony iPod Transmitter does not have an Apple Authentication chip and because of this there is no local iPod/iPhone/iPad volume adjustment possible to change the volume at the remote receiver. (2) This i10s is less than 2/3 the size of Sony's iPod Transmitter, making this a better fit for your iPod/iPhone/iPad. i10s industrial design is a better match for the elegantly designed iPods/iPhones/iPads. (3) No buttons needed to pair and connect, just plug i10s into iPod/iPhone/iPad and it will automatically pair and connect to receiver. No button also means no additional mechanical failure mode on this i10s device.